There are guided tours throughout the day.  Monitor lizards feeding on Sunday, Tuesday and Thursday in Summer (Sunday and Thursday in Autumn and Spring).  Snake feeding every Monday during summer (every second Monday in autumn and spring). Our newest residents have arrived! 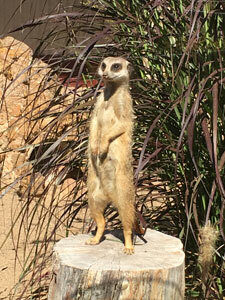 Our zoo has recently attained ZAA Animal Welfare Accreditation. We are very proud to display our accreditation here. Educational Entertainment for Young and Old! Snakes Downunder Reptile Park & Zoo is a fun and affordable day out to be enjoyed by the whole family set just 500M off the Bruce Highway  just south of Childers  displaying over 45 species and sub-species of Australian reptiles, amphibians and marsupials. Other attractions include a fantastic snake house, a walk though vivarium housing dragons and frogs and a kangaroo reserve where the animals can be hand fed. The most recent additions to the zoo are the koalas. Ian and staff invite visitors to come and meet Millie and Matilda. 9.30 am and 2.00 pm! 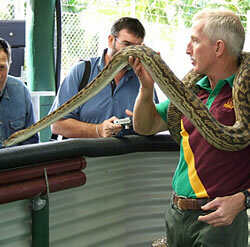 As you can see, Snakes Downunder Reptile Park & Zoo is 'much more than just snakes'. 10.00am  Snake Show featuring pythons and some venomous snakes. 11.45am  Venomous Snake Show featuring the top five most venomous snakes in the world. 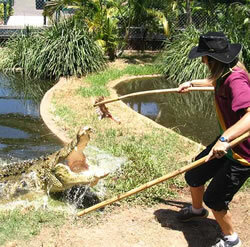 12.30pm  Saltwater crocodile feeding and commentary. Closed every Wednesday, Easter Friday, ANZAC Day, and Christmas Day. 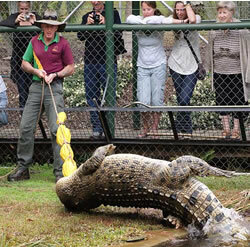 Prices includes the two different snake shows, crocodile show, reptile handling, koala talk, guided tours and entry into the kangaroo/emu reserve. 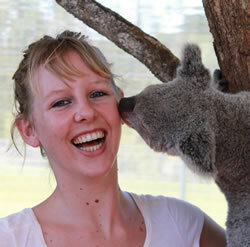 Koala Encounter - $20 per person. 9.30 am and 2.00 pm (prior booking is required). Ask about our Ambassador Cards. "This reptile and animal park was so fantastic, very informative, knowledge unbelievably amazing and the displays and range of animals just fantastic!" ...Susan.